Image quality from this camera is excellent, even at high sensitivity settings. Also, the autofocus system is fast and accurate; it can even cope with very low light levels, making this a great camera for enthusiasts who want to shoot a range of subjects in a wide variety of conditions. As you might guess, the Alpha 77 Mk2 replaces the Alpha 77, which is now discontinued, and it has an almost identical shape and design. The new camera is aimed at enthusiast photographers who want a step up from an entry-level model. Like the Alpha 77, the A77 Mark II has a 24 million-pixel sensor, but this is a new device that benefits from the progress that has been made with sensor design in the two-and-half-plus years since the A77 first arrived. For the first time in an A-mount camera, the signal from the Exmor sensor is processed by a Bionz X processor. This should mean that the A77 Mark II is capable of resolving a high level of detail and controlling noise at high sensitivity settings. Sensitivity may be set in the native range ISO 100-25,600 for still images, with a low expansion setting of ISO 50 being available. The movie sensitivity range, however, is a bit narrower, going from ISO 100 to 12,800. As the SLT design has a fixed translucent mirror, the A77 Mark II has an electronic rather than optical viewfinder. Sony has used the same 2.359 million-dot OLED Tru-Finder as is found in the A7 and 7R, which is good news since this provides a clear, detailed view. This viewfinder also allows enlargement to assist with manual focusing and can display focus peaking and zebras to indicate areas of highest contrast (sharpness). One of the benefits of the SLT design is that there can be full-time phase detection autofocus during movie shooting and when composing images on the rear screen. 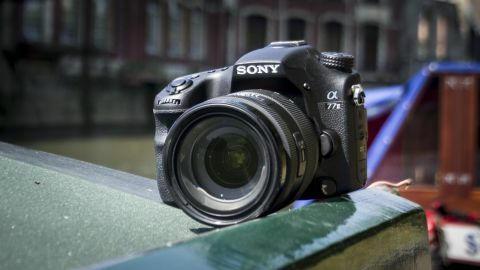 Sony has used a newly developed phase detection sensor in the Alpha 77 Mark II. This has 79 AF points, 15 of which are the more sensitive cross-type. In comparison, the original A77 has 19 AF points of which 11 are cross-type. The new camera can also shoot a maximum rate of 12 frames per second (fps) with AF tracking and the buffer has capacity to allow up to 25 raw and JPEG images to be captured in a single burst. The original Alpha 77 could only cope with 11 images in a burst at 12fps. If raw file recording is deactivated, the A77 Mark II can record around 53 Extra Fine JPEGs in one blast. Although autofocusing and auto exposure continues when shooting at 12fps, aperture is locked at the start of the sequence. If exposure needs to change during the burst it is done via shutter speed or sensitivity. Sony is rather proud of the progress it has made with the autofocusing system for the A77 Mark II. We're told that five engineers conducted field tests for six months with high-end cameras like the Canon EOS-1DX, Canon 70D, Nikon D4, Nikon D7100 and Panasonic GH3, in order to find the best parameters for AF while shooting a variety of sports and action. Sensor development means that the A77 Mark II's CCD AF sensor produces less electronic noise than previous devices, and this helps with autofocusing speed and accuracy as well as boosting low-light performance. Spot AF performance is also claimed to have been improved, with weighting given to the centre of the spot. The A77 Mark II has a collection of AF-point selection options including Wide, Zone, Flexible Spot, Local, Expanded Flexible Spot and Lock-on AF. In Expanded Flexible Spot mode the photographer selects one AF point and the camera supports this with the surrounding eight points, which is useful when shooting a moving subject. In Zone AF mode the AF points are divided into nine zones for selection. It's also possible to adjust the AF tracking duration across five levels via the menu, with low settings being useful when the subject distance isn't expected to change quickly and high settings when shooting subjects at different distances. In addition, a new AF Range Control option allows you to restrict the AF to working within a specific distance range. Adjustments can be made from the closest focusing distance of the lens to infinity with distance marker points in between that vary depending upon the lens mounted. With the Sony 16-50mm f/2.8 SSM lens mounted, for example, there are markers at 0.3m, 0.4m and 0.7m and there are two points of adjustment between 0.7m and infinity. This could be very useful when there are objects between the camera and the subject – for example the wires of a cage in a zoo. According to Sony, almost all of its A-mount lenses are compatible with the 79 AF points, but only 61 are available when shooting at 12fps. Sony's 500mm f/8 lens is a notable, but not surprising, exception and it will only allow the center AF point to be used. Other pleasant additions to the Alpha 77 Mark II's featureset include an HDMI port that can supply clean video output to external storage devices and Wi-Fi connectivity. As the A77 Mark II has an NFC chip, owners of NFC-enabled smartphones and tablets can connect to the camera by touching the two devices together. Interestingly, despite the presence of Wi-Fi connectivity, the A77 Mark II cannot make use of Sony PlayMemories Camera apps.